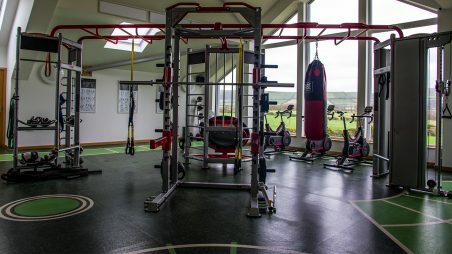 Due to the continued popularity of functional training, countless leading gyms are looking for ways to make this style of training a permanent feature within their space. We've come up with this guide to help you get the most of your functional floor markings or to inform the decision you make when customising your gym flooring products. Here's a list of our favourite functional floor marking styles and an explanation as to how you can use them for yourself and your clients. Dots, or spots, are a type of marking that deceptively simple and straightforward. However, once you really start thinking about the application, you may realise that it takes a bit of imagination to use them properly. The simplest way of incorporating sports into training is by using core strength exercises. To do this, you can essentially treat the dots like those in a giant game of Twister; hands and feet can be forced into various positions while engaging the core to hold a secure position. This could mean using set movement combinations or variations on plank, press-up or stretching positions. Another idea would be to use spots for agility and speed movements that are commonplace in many sport specific warm-ups and conditioning circuits. They could also be useful in boxing or martial arts areas, to help beginners learn the correct body positioning and footwork patterns in relation to a partner with pads or a punch-bag. Alternatively, spots could be used in a child friendly area so that they can be incorporated into general warm-up/fitness games. The key function of simple linear ladder markings is to measure the distance between the user and a piece of equipment. A couple of examples of this would be in an area where there is a suspension system, cable machine or resistance band workout taking place. Lines can be used to measure the progression of suspension training exercises. If the user is performing a TRX press up with their hands in the straps and they move their foot position one line further back from the TRX centre axis, then more of their weight is put on the unstable handles, thus increasing the difficulty and level of core stability required. The same principle could be used to help teach users where exactly they should be standing when using resistance bands attached to a fixed point, cable or pulley machine. Horizontal markings could also serve as distance marks for squat jumps or lunges, given you have an empty stretch of space available. Another simple but effective design can be the grid layout which consists of possibly a 2x2, 3x3 or even larger square. Like spots, dots and compasses this design allows you to create very flexible and challenging core workouts. For example the different squares or lines within the grid can be used to mark hand and foot positioning when doing planks, press ups, squat thrusts and other bodyweight movements. Two key pieces of functional equipment that lend themselves the best to being used with a grid design are powerbags and aerobic steps. When an aerobic step is placed in the centre of a 3x3 grid, it gives the instructor 6 distinct areas around the step that can be named or numbered to assist with the description of movements. The same applies when you are doing powerbag or sandbag work. The grid system can help indicate body position and where the user should be aiming to place/slam or drop the bag. An example would be placing the bag down in the centre of the grid and performing lateral jumps back and forwards. A compass marking would generally be used in a similar way to the grid we’ve mentioned above. For exercises where there are lots of twisting and rotational movements, a compass can offer more detailed guides to the user about the angles and positions their body should be in. ViPR loaded movement training is a type of exercise that utilises these rotational, lateral and medial movements which, can be assisted in the early stages with a compass as a reference point on the floor. In the world of functional training, the focus on body weight and dynamic movements and exercises means tools like these can make a huge difference to workout progressions and user safety. A sprint track is something that, despite its name, is not often used for sprinting in a gym environment. More common uses of a sprint track within a functional gym, include walking exercises like lunges or farmer’s walks to mark out the route for safety. Depending on the flooring type, a sprint track might also be used for sled work or tyre flips. There are a host of dynamic stretching and plyometric exercises for which the sprint track is ideal. However, for the majority of facilities that have installed this type of design, it is used as a way to designate floor space for exercises that require extra room for movement. Measurement markings can be made on the floor to allow trainers to measure progression in areas like flexibility and explosivity. As well as using markings to assess general strength and stability in different positions, trainers can make use of specific markings to give an indication of progression in tests such as standing long jump and the two and three hop tests for horizontal power. Depending on the distance available, these can also be used to measure an athlete's throwing or pushing distance, and used as markers over time. Ladders are a great training tool for sports where agility plays a big role. Football, tennis and basketball are only a few examples of sports in which agility ladders are regularly used to practice fast feet exercises. Markings on the floor save space when it comes to setting up and taking down this type of equipment. They can also be a great indicator for positioning of similar pieces of kit like mini hurdles making sure they are all spaced evenly. 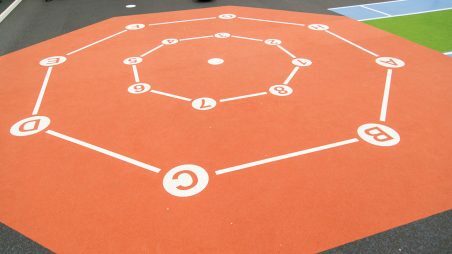 Although it’s not exactly related to a specific exercise, the designs printed on a functional floor space can be used to separate a space into distinct zones or areas; a sprint track is ideal for cordoning off an area which might be used for exercises that are dangerous to other gym users, for example medicine ball throws, kettlebell swings, or power rope movements. In general, all markings can be used to designate spaces and maintain order and safety in an open, unsupervised gym space where functional exercises are encouraged. To find out more about how you can use floor markings to organise your group sessions, read our "Using Gym Floor Markings to Enhance Your Circuit Sessions" article. The same way functional flooring markings serve as aids for specific exercises, special flooring types can also be used to create zones or encourage different training styles. 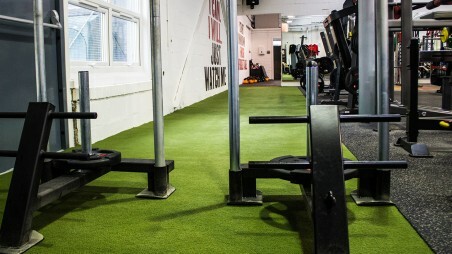 An incredible popular addition to many CrossFit boxes, or functional training areas, is an artificial turf track that can be used for pushing heavy prowlers or sleds along without causing damage to the flooring or equipment. The same can be said for high impact rubber floor tiles which are ideal for high impact training such as weight lifting. Stretching spaces are another popular zone which can be created using specific floor types. Either simple matting or softer EVA floor tiles can make it an inviting area to sit down and stretch as part of a warm up/cool down or a flexibility workout. This entry was posted in Gym Owners Advice on 17th October, 2014 by Colin Evans.